It is a big Solar System, too big to be contained in a single rulebook. Though the WARS Rulebook contains everything a Games Master or a player absolutely needs to play a WARS Roleplaying Game campaign, Battlefront takes things a few giant leaps further. Within the pages of this book, meant for Games Masters and players alike, readers will find a wealth of information to deepen and enrich their WARS campaigns. 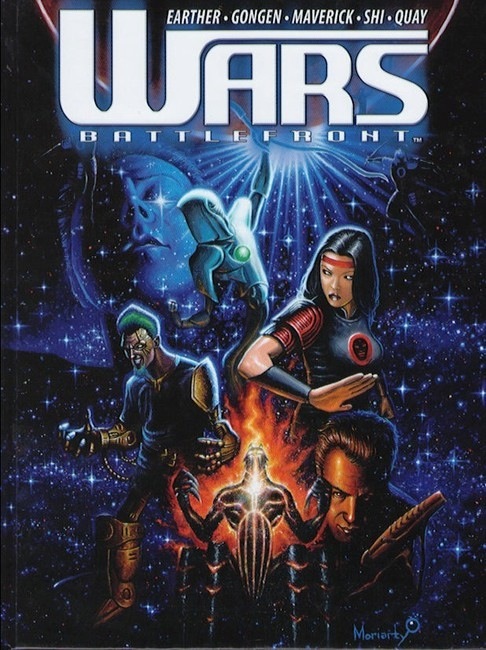 Battlefront contains an in-depth look at each of the factions, detailing the Earthers, Gongen, Mavericks, Quay and Shi as never before, including background and cultural information on each, as well as tips and strategies for creating a mixed-faction group of Player Characters. Those looking for more options and alternatives for characters will find a treasure of new prestige classes and kizen abilities to give Player Characters an extra edge or give Non-Player Characters a few hidden and unpleasant surprises to spring on the Player Characters themselves. 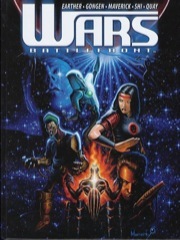 The WARS Roleplaying Game is not bound to a single planet or moon rather, the plotlines and Player Characters tend to range throughout the Solar System. Battlefront offers an enormous section on the Solar System itself, detailing the background and physical aspects of each of the planets, as well as major moons, asteroids and even space stations. From the surface temperature of Mercury to the necessary escape velocity of Charon, from the penal colonies of Io to the boomtowns and brush wars of Titan, this exhaustively researched section of Battlefront holds all the answers. The section on travel in the Solar System brings it all together, giving Games Masters rules and guidelines for determining how long a trip from Earth to Europa will take, or how much time is required for a transmission from Gongen to reach Ceres. Packed with even more information, Battlefront is an invaluable addition to any WARS Roleplaying Game campaign. Sign in to start a discussion about Wars Battlefront Hardcover (OGL)!